Has of the 12th August 2011 i am a FULL UK/CEPT CLASS 1 license holder it has been a lot of hard work and i could not have done it with out the help and support of my family and friends i would like to thank them all and thank you also goes to the Burnley Radio Club and its members for taking the time for us to sit the advance exam on a Friday night. I have been interested in "radio" since 1980 when i got given a 2 channel am cb radio handset. I moved on to various different cb radios in the next few years. I did the city and guilds in amateur radio in 1985 but only took paper one of two due to being ill at the exam centre and so never obtained my "G" callsign. Looking back i should have resat paper 2 and obtained a callsign. I left all radio for a few years in the 1990s but came back on air having past my "foundation exam" in early 2003 and obtained the callsign M3CSZ in 2005 i started a new job which gave me very little time for radio but now i have changed jobs and after a chance meeting with a old friend i bought another radio and the interest came flooding back. I took and passed the intermediate exam in April 2011 with the help of the Ripon and District radio club and my friend 2E0HTS which gave me the callsign 2E0JBC. 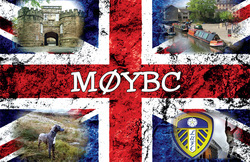 MY QSL INFO:- i will QSL 100% DIRECT and or EQSL .QSLs BURO QSLs are also ok but do take time for me to receive them. Please send me a qsl in the mail as well as eqsl if possible and i will return one via mail also thank you. MY LOGBOOK IS ALSO UPLOADED TO HRDLOG ONLINE AT TIMES BUT IT CAN BE A FEW WEEKS OR MONTHS BEFORE I UPLOAD BUT AND YOU CAN PRINT A QSL FROM THERE ALSO ..